This super soft heather grey shirt is our most popular. 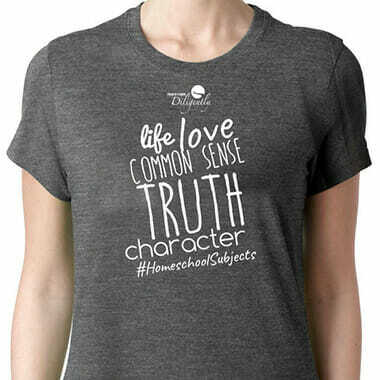 As homeschool parents, we know which homeschool subjects matter: Life, Love, Common Sense, Truth, Character and a few others that we plan to release in another shirt design. This shirt looks great and is fun. It comes in Adult S/M/L/XL/2X/3X and is incredibly soft. Sizing runs true. Pricing includes tax and shipping.